I’ve always had a fond place in my heart for Vidcon, the celebration of YouTube (s GOOG) and web content founded by John and Hank Green. 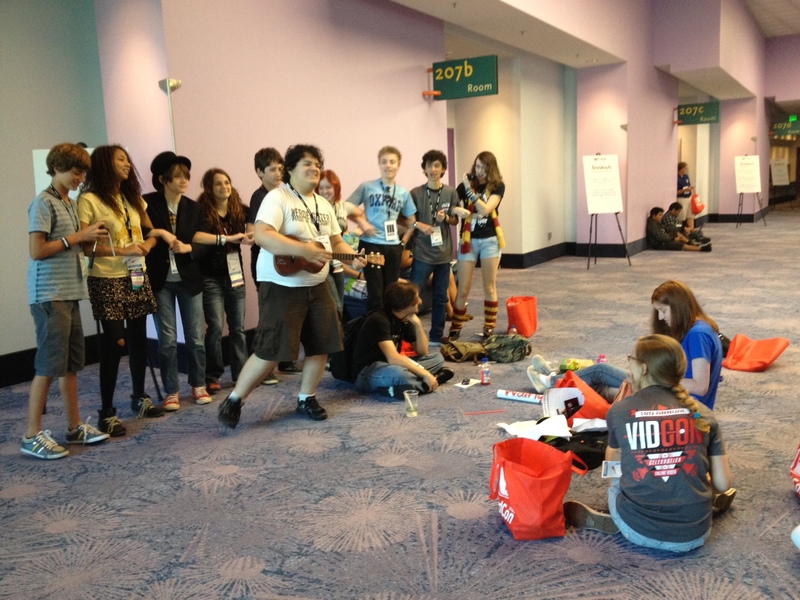 Whenever I read articles claiming that YouTubers are a fad, I remember Vidcon. 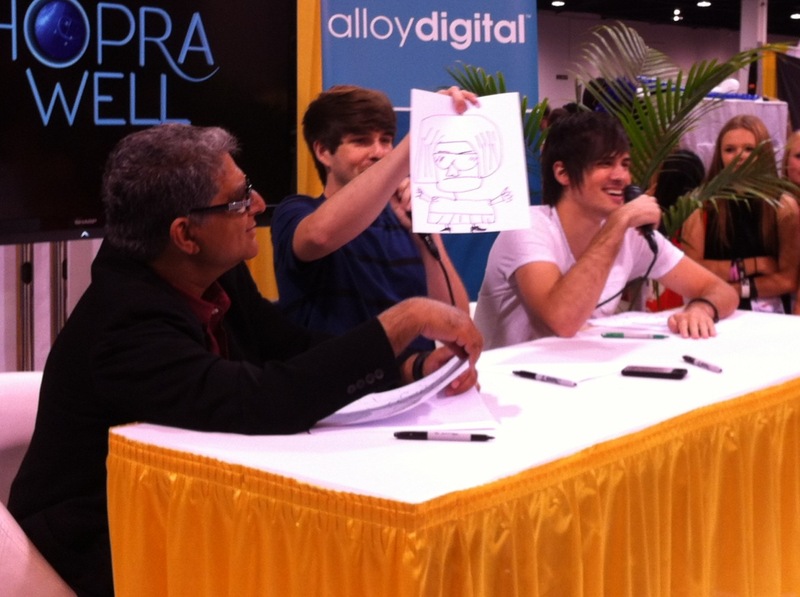 Whenever I worry about the direction this industry is going, I remember Vidcon. Whenever I hear someone scoff at the viability of web original content, I remember Vidcon. Because every year, Vidcon serves as a real-time, real life reminder of the vibrant community that cares passionately about online video — a community born in comment threads, response videos, retweets and subscriptions. It’s a young community. It’s a very specific community. It’s largely united by inside jokes and Doctor Who references. But it’s impossible to ignore. A hybrid of professional conference and fan party, Vidcon moved from the Hyatt Regency in Century City to Anaheim this year entirely because of huge demand and the Regency’s occupancy limits. Vidcon 2011 topped out at 2,500 attendees — attendance over the three days of the 2012 conference was estimated at 7,000 by Vidcon Head of Content Jenni Powell. YouTuber Jon Garcia, in performance, in a hallway. And random run-ins are common — unexpected people appearing in unexpected places. Photo courtesy of Tubefilter’s Josh Cohen. This year, a day at Vidcon broke down into two portions: The mainstage shows, in which YouTubers took the stage for tightly pace intervals, showing off their random talents or just taking questions from fans, and the breakout panels, which featured more focused discussion. The breakout sessions required impossible choices for those passionate about the digital content space: At 11 AM, for example, Bernie Su and Freddie Wong took on the future of storytelling while the Gregory Brothers and the Double Rainbow guy spoke about creating viral videos. I wasn’t expecting to get inspired by the Double Rainbow guy. But that’s Vidcon for you, where some of the best moments are the most spontaneous. Director Kevin Smith, who’s launching the YouTube channel Loud and was speaking on a panel about personal branding, confirmed something I said back in 2011 — that if he were just starting out as a creator today, he would be working on the web. “Every one of you is a potential content generator,” he said. Whereas in 2010, YouTube stars were the primary focus at Vidcon, this year web series like Squaresville, Machinima’s Bite Me and The Lizzie Bennet Diaries had a strong presence. Lizzie Bennet deserves special mention: Created by Hank Green, with Bernie Su serving as showrunner, the modern-day retelling of Jane Austin’s Pride and Prejudice not only filmed two special episodes at the conference, but its spotlight panel, scheduled for 1 PM on Saturday, was filled to capacity by 12:30, and dozens more fans were turned away at the door. It’s hardly a suprise that there was a large crossover between Vidcon attendees and Bennet fans, given the Hank Green connection and its vlog-style format. But fans for more traditional properties like Husbands and Video Game High School were also represented — continued proof that not only is the audience for web original content growing rapidly, but it’s interested in more than unscripted content. Meanwhile, not everything on the main stage was a success — comedian Kyle Mooney was full-on booed off the stage during the Saturday afternoon session, thanks to a crass and off-key character bit. But the four stars of SourceFed (currently the number one YouTube original channel online) brought the room’s energy back up immediately afterwards with an energetic rundown of recent news. Love and respect have always been key VidCon themes, energies to be applied towards the creation and consumption of unique content. The end result is the peaceful clash of a thousand cults of personality. It’s not a perfect distillation of the current reality of making web video. But as a taste of what’s possible within the space — of what causes all these creators to slave away for viewcounts — it can’t be beat. Great article. Hank and John are great advocates for the community behind YouTube and keep it moving in the right direction as best they can. Vidcon going as well as it did with that many attendees is an amazing achievement considering it’s only 3 years old. Looking forward to Vidcon 2013.